Engine drive welders are incredibly versatile machines. They work with stick, TIG, MIG, and flux-cored welding, with an AC or DC welder, and can be run on diesel, gas or propane fuels. These mobile engines are also fully encased – a must-have if your welding jobs are outdoors or if don’t have access to a power source. Some engine drive welders even have enough juice to act as a portable generator, providing auxiliary power for your job site, making them great on construction sites or in remote areas. Today’s engine drive welders are more refined than ever. You’ll find them outfitted with emissions controls, remote output controls, and a rugged undercarriage for ease of movement. Below, we take a look at some of the more common features found in an engine drive welder to help you make a purchase decision. AC Or DC Output. The very first question you’ll need to answer is whether you need AC or DC output. AC machines are usually less expensive, smaller, and easier to transport than DC machines and provide AC power for small power tools. Just be sure to have AC stick electrodes on hand for welding. DC output machines are more complex and thus, more expensive, but they work with a wider range of electrodes and provide smoother welding outputs. Frame Durability. If you plan to use a welder outdoors, a durable frame is a must-have. You will find machines with tube frames as well as those that are completely enclosed for added protection. Look for large diameter, rugged and sturdy frames. An enclosed case also helps contain noise. Cast-iron cylinder, commercial grade engines are a better choice if you plan to use the machine everyday or nearly every day. For hobbyists, a commercial grade engine may be too expensive based on how often you plan to use it. Fuel Type. As we mentioned above, engine drive welders run on many different types of fuel. Gas engines are the most portable and the most popular, but you may prefer diesel or even propane. Electric Start. Electric start may sound like one of those “nice to have” features, but for larger engines it’s practically a must-have. Anything above 10 HP is difficult to pull-start, especially when it’s mounted to a truck! This is a convenience feature we recommend splurging on. Engine Idler. Idlers reduce noise and save on fuel. The machine slows engine speed down once the weld is complete or you stop drawing AC power. This helps save on fuel usage and reduces wear and tear on engine components. Run Time And Fuel Tank Size. Be sure to evaluate estimated run time if you tend to work on large jobs. You don’t want to have to stop and refuel mid-weld! Some machines have a fuel gauge with an hour meter to help you keep tabs on your fuel situation. Look for engine drive welders that have at minimum a 5 gallon tank; 10-12 gallons is better. Control Access. Think about where and how you will mount the machine and make sure the controls will be accessible to you. Controls at the front of the machine are fairly standard and make the most sense, but don’t assume that’s where they are located. Double check to be certain. Engine drive welders are important pieces of machinery that are vital to your welding operation. Make sure any new machine that you buy includes a warranty. A 2-3 year warranty is standard, but they do differ between manufacturers. Always ask about the warranty, so you know what you’re getting. 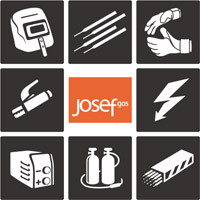 Also ask about different warranties for the welder vs. the generator parts of the machine. They could be different. Try to avoid that situation if you can; it’s just easier to have the entire machine warrantied for one length of time. 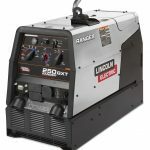 One engine drive welder that we can’t say enough good things about is the Lincoln Ranger 250 GXT. This is a 250 amp AC/DC gas-powered welder/generator that can be used for Stick, TIG, MIG, Flux-Cored, or Gouging. A 23 HP Kohler engine provides a peak 11,000 watts or 10,000 watts continuous power. It has remote capabilities and a few special features like a fuel gauge with hour meter and stainless steel casing. Visit Lincoln Electric to learn more about the machine or stop in to Josef Gas to see it in person!